This month, I’m honored to be sharing my tips for aging gracefully on the Yoga For Healthy Aging blog! Whatever season your part of the world is experiencing now, spring will arrive sooner or later. Spring is the season of renewal, new life, new growth, and vitality both for the planet and for each of us. Vitality is one of the meanings of the word “juicy” and best expresses Maria Mendola’s recommendation for spring: “Get Juicy Now!” The idea being that being vital and getting juicy is about embodying health, radiance, contentment, and so much more. Juicy joints, juicy thoughts, juicy moves! Let’s age, juicy! Isn’t that a helpful image to keep in mind as we age? I decided to interview Maria for a couple of reasons. I’ve known her for many years, and have been fascinated by her story and impressed by the way she “walks her talk.” I’m encouraging her to write a book and have offered to help. Recently we were teaching together in the foundational two-week training for the Integrative Yoga Therapy program, and I decided that interviewing her would make a good post for this blog and might be a way to move the book agenda forward. Let me tell you a bit about her. Maria began her work in the health field as a holistic nurse. She has since studied with Dr. Vasant Lad, the late Mukunda Stiles, Tias Little, and Joseph LePage. For her, the idea of aging juicy began with a personal crisis. Twenty years ago as she was riding her bike in Mexico, she was hit from behind by a pickup truck. The accident resulted in massive brain injury and a broken back. She was told she would never walk again. 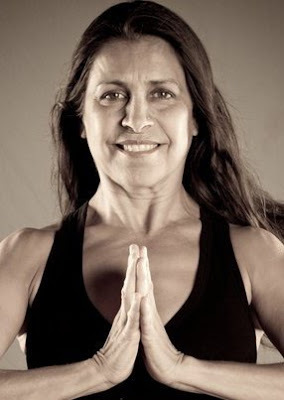 She used time and yoga to begin the slow process of healing and self-discovery. 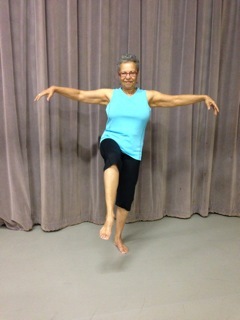 Now at age 58, she is walking, running, dancing, teaching yoga classes, managing a yoga therapy practice, offering a Yoga Alliance Approved training program in Functional Yoga Therapy, and can dead lift 120 pounds with perfect form. She is a walking source of juicy advice for aging well and functioning optimally. Her recipe for healthy aging consists of three words: Expand, Nourish, and Root. I asked Maria to recommend a yoga technique for each concept. Stand in Mountain Pose, with your feet slightly wider than hips-width apart. Shift your weight and strengthen into your left leg. Keep your spine straight, and your eyes open and focused on a point on the ground in front of you or straight ahead. Inhale and expand as you float your arms out to the sides, bend your right knee and slowly raise your right leg in front of you until it is in line with your hip. Pause at the top of your inhalation and hold for a beat or two. On your exhalation, release your arms and legs and return to Mountain pose. From Mountain pose, if your feet are not already slightly wider than hips-width apart, step them into that position. Shift your weight and strengthen into the right foot and leg, and repeat the pose on your left side. Repeat at least six times on each side. Maria recommends practicing in bare feet on a firm surface. 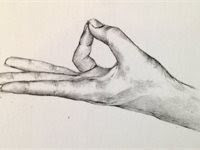 In your favorite seated position, touch the tips of your thumbs to the tips of your little fingers, and extend the other three fingers straight out. Rest the backs of your hands on your thighs or your knees. Soften your shoulders and sit with your spine comfortably straight.